My daughter has about a month left of school, and while she usually does a fair bit of summer camp activities, I’m still getting worried about how she’s going to entertain herself in the times when she is home (I work from home, so there is quite a lot of entertaining herself). I may just give her this list of 25+ DIY toys to make at home from Babble Dabble Do and tell her to go to town. There are flying toys, spinning toys, puzzles, building toys and more, and definitely some things I would want to make and that I’m sure my daughter would love, too. 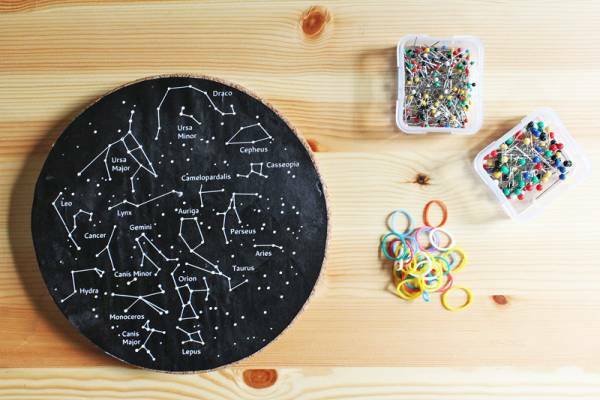 I know she’d have fun with the constellation geoboard, pictured above, as well as the paper building blocks, kaleidoscopes and discovery tubes. What a great collection to keep on hand for I’m bored moments and rainy (or hot) days to come!